I love vegetarian food, but one of the hardest things about becoming a vegetarian as an adult is that by the time I reached my 20’s, my tastes were pretty much set, and it was hard to give up the foods I’ve loved all my life. 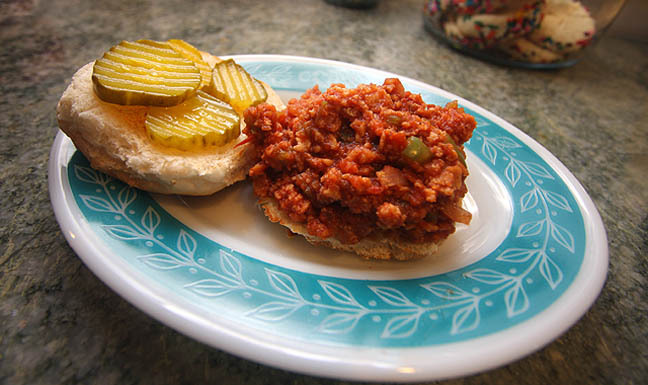 Another one of my made over favorites is sloppy joes! Saute the onion and green pepper in olive oil until it’s soft and lightly browned. Add the remaining ingredients and simmer, stirring often, until the majority of the liquid is absorbed. I usually serve this in toasted whole wheat burger buns with pickles. The recipe makes a decent sized batch (think Manwich), how many sandwiches will depend on the size of your buns and how full you make them. Standard size buns are easier to handle than the bigger sandwich size buns. I LOVE this idea! I was a vegetarian for over a year. I married a meat and potatoes kind of man and that had to go out the window or i’d be making two meals each night LOL. I’m definately going to try this recipe! Thanks for reading and leaving a note! I hope you enjoy the recipe.